EL PASO, Texas  Authorities say a 21-year-old Texas National Guard soldier was one of two men killed on a street in the violent border city of Ciudad Juarez, Mexico. Spokesman Arturo Sandoval of the Chihuahua state attorney general's office says family members identified the soldier as 21-year-old Jose Gil Hernandez of El Paso. The identity of the other man was not available, and details on the incident and the dead were few. A message left with FBI El Paso spokesman Michael Martinez by The Associated Press on Wednesday night was not immediately returned. However, he told the El Paso Times that Hernandez was shot about 1 p.m. Wednesday in the Colonia Revolucion Mexicana in Ciudad Juarez. Martinez told the newspaper that the FBI and the Army's Criminal Investigation Division were trying to verify the details of the shooting. A message left Wednesday night with a spokeswoman at Fort Bliss, near El Paso, was not immediately returned. A terse statement issued by Fort Bliss on Wednesday afternoon said only that its investigators had not confirmed the identity of "the individual involved in the incident in Juarez." Hey, tell Zerokill to be careful down there, okay? 2,000 people have died in this town through drug lord violence...it is literally right over the border from El Paso. Kind of like going from Fort Lauderdale to Miami. Yeah...Mexico City doesn’t seem too bad. That's how slime like that operates. Bringing attention to it would beg for action and we don't want that, do we? At BorderlandBeat.com, there's an article about how cheap grenades are...$6.50. They're coming from El Salvador, Guatemala, Belize. Obama should go down and campaign for Senate Seats, hell he is lettin them vote. I’m active Army. There are policy memos posted in various places warning us not to go anywhere in Mexico within 50 miles of the border. 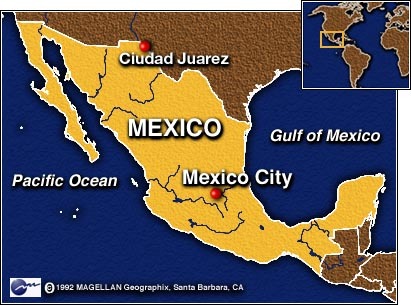 The city of Juarez and the entire state of Chihuahua are included in this order. Military cannot go; civilians are strongly encouraged not to go. I wonder, don’t National Guardsmen get the same memos? Unless he is on active orders or in an active drill period I do not believe he falls under the same rules as active duty. I could be wrong but that is the way I remember it from being in both. Back in 1994, when I visited Mexico it was all quiet on the Western Front. IIRC driving through El Paso on the interstate if you look to the imediate south you are looking at Ciudad Juarez. You can see the houses from there. So you could see it from your house? To use another popular axiom. "At BorderlandBeat.com, there's an article about how cheap grenades are...$6.50. They're coming from El Salvador, Guatemala, Belize." Contrary to the bogus leftwing claims that Mexican violence is fueled by guns from the US, those countries are also where the overwhelming majority of the the guns - actual fully automatic military weapons - used in their drug wars have come from. Many are leftovers from the civil wars that raged in Central America in the recent past. Others are almost certainly from the same Commie benefactors arming the narco-terrorists of Colombia. SNIPPET: “It appears he was shot to death by un-identifed gunmen. The victim is being id’d as 22 year-old Jose Gil Hernandez Ramirez. Investigators say he was gunned down Wednesday afternoon in a central Juarez colonia. I though Juarez was put “Off Limits” to service members. There are policy memos posted in various places warning us not to go anywhere in Mexico within 50 miles of the border. So messyco gets 50 miles of our country all along the border.